We are saddened to learn of the unexpected passing of Dr. Richard Ruíz, who had a long and beautiful career at the University of Arizona. His thinking has influenced many students, teachers, and me. When kids, who speak other languages, come to your school or community, what is your perspective, your orientation, your approach? For example, if a French-speaking student comes to your class and still needs to learn English as a new language, what is your perspective? Or what if that student speaks Spanish, what is your perspective? Do you approach the students as if their language is a problem, a right, or a resource? Turns out that we are in the classroom with them. Our own perspective/orientation matters. As a nation, we have a long history of the language-as-a-problem. However, much of the world approaches other languages as a right and/or resource. Today in our little Howes, SD (Pop. 2) grocery store/gas station/post office, I heard a wonderful conversation in Lakota. And, I’m happy to report that I saw no evidence of anyone carrying around the baggage of language-as-a-problem. In 1988 Ruíz argued that the language-as-resource orientation offered the most social, economic, and political benefits. Many in the world now assume that language is a human right. Ruiz, R. (1988). Orientations in language planning. In S. L. McKay and S. C. Wong (Eds. ), Language diversity problem or resource: A social and educational perspective on language minorities in the United States (pp. 1-25). New York: Newbury House Publishers. Happy Memories to all of you who have borrowed my treasured book. I find that Richard Ruiz’s approach to language planning sums up the attitudes that you come across when speaking to staff who work with English Language Learners. I think far too many teachers plan for language learners as if their primary language is a problem. I think I lean towards thinking of language as a resource. Last year in my class of 11 language learners there was a constant switch between classroom instruction and classmate talk in both languages. We did several lessons on learning Spanish (the primary language of my language learners) and talked about the meaning of words in Spanish that related to our lessons. I do also believe that language is a right and that is why the students in my class always have the right to speak whichever language they choose. Learning can be enhanced even further if language learners make connections between content areas and between their multiple languages. Thanks for taking time to thinking about Richard’s legacy to us all. In your concise little paragraph, you connected his 3 orientations to your own classroom and school. I’m with you: languages are a resource and languages are a right: A human right. The discussion of languages in the three perspectives described by Dr. Ruiz is interesting. Often I’ve only seen it discussed as one or two perspectives: either as a problem verses a resource or a problem verses a right. The explanation of three perspectives makes sense. As noted above, I’ve often seen languages viewed as a problem to be solved or a barrier to be overcome. In either case it’s still seen as a hindrance. To an extent I can see how this occurs. If two people who don’t speak a common language try to communicate with one another, it is a kind of problem solving activity to get their meanings across. It does not mean, however, that we should be taking on an overall language-as-a-problem perspective. Without having read more fully yet into Dr. Ruiz’s writings, language as a right is a good step from the problem perspective. Still, I almost get the sense that if something is seen as someone’s right, it could be boxed in as something that is basically just tolerated, allowed, or accommodated. To say language as a resource, however, could imply that something has value that needs to be shared, celebrated even. It means there is a skill or knowledge the can be used or shared, especially in a classroom. Taking a moment to reflect on where we fall on this spectrum is a useful task as it can unintentionally influence our actions and work. This is some very good food for thought. Good food for thought: Yes, Jenise. I am happy that you took time to think about this and to share your thoughts. It is so interesting to think of language in these terms. There is so much that we can learn from one another and our languages. Right now my mind went to the political side of things with some presidential candidates spouting, “Speak English or leave!”. These people are seeing it as a problem. I think it is out of fear. Why not embrace language and our differences? It’s so much easier than trying to alienate people. Fear is exhausting and gets you nowhere in the long run. The world is constantly changing and evolving. Point in case English has changed. Have you ever tried to read Old English or the original Beowulf? Are the single language people not the ones who suffer the most? As I begin to ponder his three social orientations toward languages and their role in society, my initial feeling is that Language as a Resource is the healthiest prospective. What I mean by this is that believing something is a problem seems to stifle the possibilities that can come from it. I get the same feeling from believing something is a right – the answer is black or white, there is no grey area. However, if something is believed to be a resource there are numerous possibilities, there is room for flexibility, and there is plenty of room for discovery and growth. 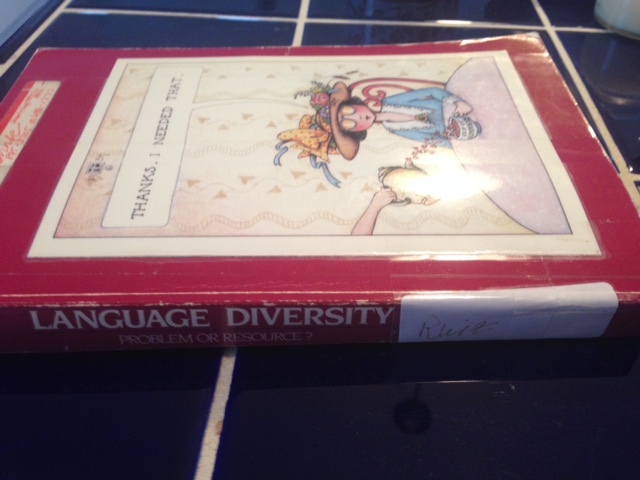 After reading about Richard Ruiz and his three orientations toward language, I was drawn to reflect on languages in our schools and society in general. When I thought about the students and their perspectives on language I see them being more of believers in language as a resource. They are accepting of their peers in a way, that as a parent and a teacher, it makes you proud. They also know how to use their peers as a resource and the peers are eager to help. I think it is often easy for some of our teachers to look at language as a problem. Especially for new teachers, or staff that do not work with ELLs often. They sometimes see the language as a problem that they have to work around. But I on the other hand look at language as a resource. I am able to use a student’s native language to help build on vocabulary and build a sense of culture in the classroom. As a first year teacher I am already feeling overwhelmed at times. I think this is because I am a learner and through my learning experiences, the list of things I hope to accomplish as a teacher grows. After reading about Richard Ruiz, I am excited to try changing the mindset that some of our teachers have about language. As the ESL teacher, I not only want to help our students grow and learn, but its my hope that I can provide resources and knowledge to classroom teachers to not only help them see language as a right, but also a resource. Ruiz’s idea of language as a resource paved ways for new attitudes about ESL. While I think that language can be seen as both a right and a resource at the same time, I can see how it offers the most benefits to see it primarily as a resource. I think many people need to see something as a resource they can gain from before they are willing to protect it or nurture it. Thank you, Keeley. Yes, his 3 orientatons did pave the way for some new attitudes. I appreciate Richard’s breakdown of perspectives of the social orientation of language. My first thought was how introspective he had to have been to formulate this theory and that it invokes the same introspection in myself, to me, indicates that it carries weight. Personally I would like to see more of a shift to Language as a resource perspective adopted in our education system. I believe with our families with a first language other than English simply having this perspective would create a ripple effect in our relationships and thus have a positive impact on the student’s education over time. Having this perspective also says a lot about the society and community values and is a community I want to be a part of. Thank you, Elizabeth. I agree that Richard’s perpsective work like a ripple. The world around is one that is not welcoming when things are different. I had some students in my class that would not collaborate with my ESL students. We then had a class meeting about how different languages and cultures can enrich our worldly understanding of our surroundings. Perspective is all about those behind it and how they use there gift. Language is a very complex subject that will forever intrigue many of us that study it and work with it. Ruiz simplified some of this with his three social orientations of language; language as a problem, language as a right, language as a resource. It seems to make sense to me and I think many a people, including myself, have visited each of these areas from one time to another without understanding the how and why it can occur. I found it interesting to see how they all have an impact that can be positive or negative. The approach that I believe to be best is language as a resource. I like to think of it as an asset really. Language, a way to communicate between the past and present and future. It continues to evolve and we need to be a part of that change for the positive. This was interesting, especially coming from the area where we live. I think in general language is viewed more as a problem of the student by the general population. I would like to use language as a resource to broaden the world around us versus struggling with language as a barrier to learning. Recently my students and I discussed the Declaration of Independence and the Bill of Rights, specifically the 1st Amendment. No where does it say in this country that English is the focal point of the 1st amendment. However, life is much more challenging for those that are learning English as a 2nd language. Ruiz’s point-of-view for each of these areas is thought-provoking for those of us focused on English Language Learners. I love hearing that you and the high school students in your classes are using the primary sources. Language is a right and a resource. There are so many beautiful languages in the world as there are beautiful cultures and societies from which they developed. Looking at language as a problem, is like completely disregarding the beauty of anyone’s culture and identity. I am always amazed when I meet others that speak a different language or dialect. I think that their speech is a beautiful part of who they are, so how could that be a problem? Yes, our language is central to each of our identities. 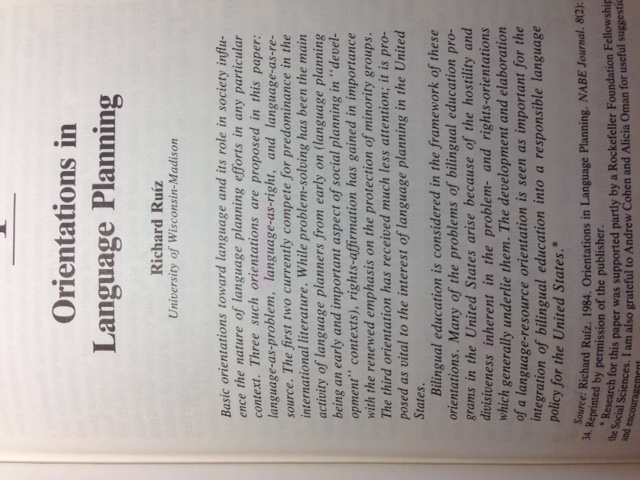 As I read Richard Ruiz’s orientations in language, I feel fortunate that I teach at a designated ESL school. This year we have over 100 identified ELS students which means language variations are a part of everyday and every activity. I see this as a benefit to both non-English and English speaking students. I observe students that do not see language as a problem but they see it as a resource. They can speak with and about multiple cultures and can help to teach English speaking students as well. Both English and non-English speaking students see the variations daily and learn to accept them and learn to accept each student as individual. They understand better than many adults that everyone has the right to be who they are. The biggest problem I see is the inability to present content to all the learning levels, but this is not a new problem to a classroom. As teachers, we need to remember everyone comes to school with a different set of tools. It is our job to use the tools they have and provide them with additional tools to be successful. Yes, Jill, it is a struggle to find teachers with the depth of 2 languages in all of the content areas. It is interesting to me that this is the topic, as tonight before I read this tribute I had dinner with my parents. Somehow the conversation English Language Learners came up as well as the fact that our district is looking at implementing a Dual Language Immersion program at one of our new schools. They both expressed their opinions in the language is program social context by asking, “Why are we obligated to teach them English?” and stating, “They need to learn English just like everyone else.” I first explained that it can take up to 12 years to acquire the English language, it is not something that happens in a year. I then expressed its discrimination not to and linked it to special education. I can’t not teach a with a learning disability just because they don’t learn like every other student. It is our responsibility to provide special education students with the resources they need to be successful so why would it not be our responsibility to provide English Language Learners with the resources they need to be successful? Of course I received the response of that’s different. Just an example of the “Language is a problem” social orientation and the fact that this orientation is still very much a real belief for some people. This tribute and that conversation also made me evaluate my own beliefs about the social orientation of language and how those beliefs have evolved based on my environment and my own experiences. I started out with the same beliefs as parents, not surprising given I grew up in their house. My beliefs started change when I met and married a man who is Hispanic (we are no longer married). Though he does not speak fluent spanish he can understand it and his family members speak both English and Spanish. Their language is so much a part of their culture and their closeness as a family. My social orientation evolved even more when I took ESL courses from Prescott College in Prescott, Az. The focus of these courses was Structured English Immersion, which I never completely agreed with, as the philosophy is that students are not allowed to speak their native language at school or use text in their native language at school to assist in their acquisition of the English language. Because of these experiences and in classrooms with ESL students I value other languages and think of them as resources. We can learn so much about our students and their cultures through their language. It is very interesting to have conversations with them about their values, beliefs, and life at home. I also value those who can speak more than one language, as I know very little Spanish. They have an amazing talent, which allows them unique experiences. I would love to be able to incorporate Spanish into the classroom like Katelyn at some point. I believe this helps students know their language and culture is valued. Ruiz with his 3 social orientation towards language is right on. We all need to stop and re-evaluate our beliefs and how these beliefs come across in our classrooms and how this affects not only our ESL students but all of our students as we are role models for students and the other students will pick up on our attitude as well. Yes, Amanda, and re-evaluating our long-held assumptions is always such a painful process. We, teachers, think of ourselves as lifelong learners, and this is exactly what we are called to do throughout our life.